R75—a pattern round was were I stopped. before ending with an other round of plain knitting. R81 is next, and it's followed by 10 more rounds of 720 stitches till I finally get to R91 and start the minuscule number of decreases. I've moved onto a longer circular needle, a 40 inch—vs the previous 29 inch one, so for the moment, it's possible, once again, to see a wedge of the pattern--and clearly, feather are emerging. Still I want to race to get it done. 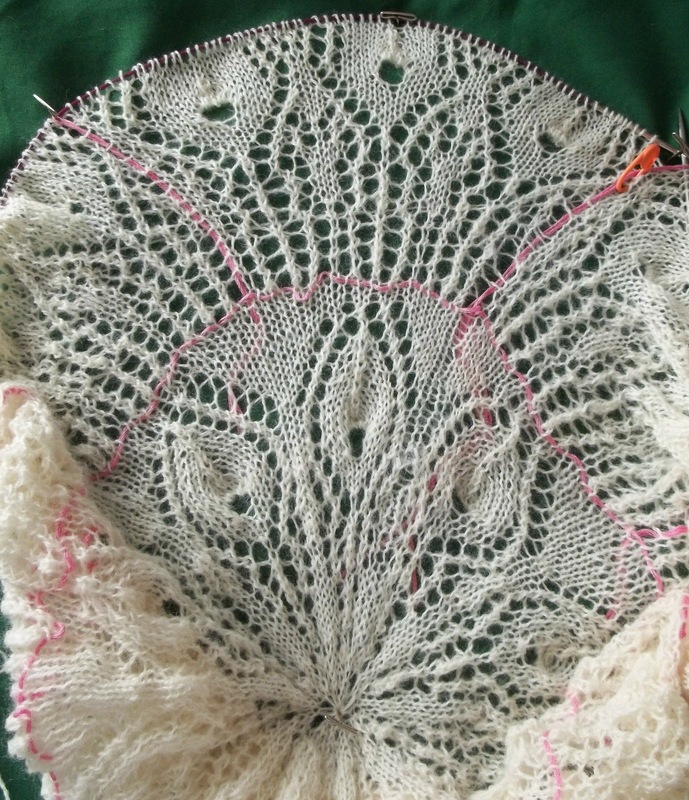 The rounds will be come more tedious (and less enjoyable) as the shawl gets bigger and bigger, and it will be harder to work those round in the heat of summer. Every extra bit I get done, is done. There are about 150 days between May 1st and October 1st –(and some time has to be allowed for hand painting and blocking) and now, there are more rounds to knit than there are days to knit them. (If I knit at the rate of a single round a day) I have to complete at LEAST a round per day—and really 2 or even 4 rounds. Especially now while the shawl is relatively small—I don't want to think about the future rounds—where the stitch count is over 1000 tiny stitches of YO's and K2tog's! And I am giving NO THOUGHT to the idea of frogging a single round. There has been some tinking, and some fudging (a YO or two has been missed, and pull out of the air) but (knock wood) so far the work is going well. One compensation is—It really is, even in its ghostly white, a beautiful design. I think I could wear a rag, and drape this shawl over it, and no one would notice anything besides the shawl. It will be a stunning part of my outfit. I won't put it on till after the ceremony—I have no desire to steal the attention from my DD (who has picked out really beautiful dress, and will easily be the star attraction) but I suspect the mother of groom will be a bit put out. I know the rules of wedding etiquette--the mother of the groom is supposed to take the lead from the mother of the bride--but L is all excited--this is her first born getting married (and the first wedding in the family of this generation) and she is super excited. She's selected half a dozen dresses already--(some of which she has gone so far as to purchase!) and my DD feel it likely she will find a half dozen more. I haven't even started looking --except in the most casual way--(window shopping)! No matter what dress she decides on, nothing will hold a candle the shawl! 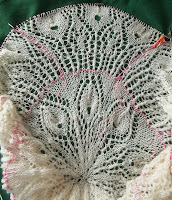 I am thinking a rather simple, plain dress--something to act as a simple back drop to the shawl. I have decided I want a fancy purse--one decorated with peacock feathers--another simple detail--that will be drop dead gorgeous. I am thinking-- maybe a knit bag, (felted) with one side a lace overlay (the same peacock lace as shawl) and the other side, decorated with sewn on peacock feathers. I want to knit a small patch of lace anyway --to test paint before I start to paint the whole shawl--and this swatch would be perfect for purse cover. Today, I'll get my shawl rounds in early—because I want some time to work on my socks—Not a single round was knit on them yesterday. And yeah, I have yet another detail exam of another part of my body on Tuesday next, and there will be, no doubt some hours of waiting, and plenty of time to knit socks. But they are lovely too, in a totally different way, and a nice mental change to go to a simple 1, 2, CHANGE stitch count for a pattern. That shawl is drop dead gorgeous, and you are doing a great job, as usual, in keeping it looking lovely! The one I am trying to knit is patterned every round and is a bear to keep track of, even with stitch markers. I'll have to pull it out this summer and assess whether or not it gets the frog pond and a restart. Gorgeous work, Helen! And thanks for the prize . . .